I’ve never figured out why soccer is so popular in some parts of the world. What’s the point of watching people run up and down a field for 90 minutes when the result is usually a 0-0 tie? But non-Americans generally don’t get the point of baseball, so I guess it’s all a matter of background and taste. I mention soccer because it’s an excuse to write about competitiveness and taxation. Except I’m not going to write about low tax rates and job creation, or low tax rates and capital formation. Instead, today’s topic is tax competitiveness and French soccer. And since the French care about soccer, maybe this will be a valuable opportunity to teach them why high tax rates are a bad idea in all areas. Though you won’t be surprised to learn that the French government is on the wrong side. Here’s how the New York Times begins a story. Monaco may seem almost comically tiny, less a real country than a glorified safe deposit box festooned with palm trees and Lamborghini dealerships, but it teems with interesting statistics. Population: 35,427. Number of nationalities represented: 125. Unemployment rate: 0 percent. Income tax rate: 0 percent. So far, so good. I’ve written favorably about Monaco and I have no objection to this description. 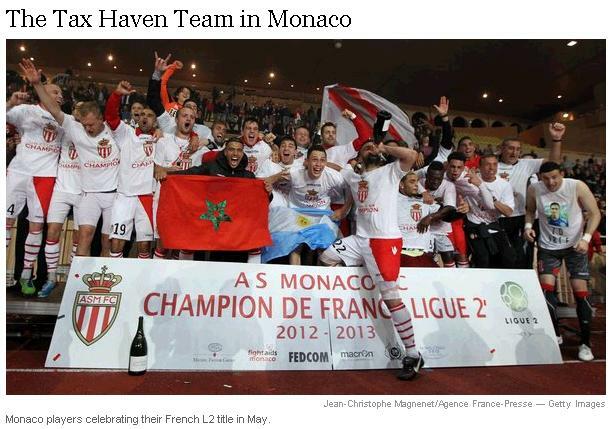 And it seems that Monaco’s fiscal policy is good for the local soccer team. …a potash fertilizer tycoon…in 2011 expressed his support for his adopted country by buying a majority stake in its struggling soccer team, A.S. Monaco, and proceeding to aggressively vacuum up expensive European players. …Monaco is different from other countries. Rybolovlev can offer players…liberation from the petty annoyance of income tax. This is a happy prospect no matter what you earn; it begins to look like bliss when you count your income in millions. But it seems there’s a controversy in this fiscal paradise. Or, to be more accurate, there’s a controversy in the tax hell next door. …it puts the rest of the French league at a significant disadvantage. While Monaco basks in its special tax status, players for French teams are subject to the kind of high tax rates that recently motivated the actor Gérard Depardieu to renounce his citizenship… It’s like having a major league baseball team in the Cayman Islands. Gee, what a surprise. The French are complaining that lower tax rates are an “unfair” form of tax competition. So how did the French react? By engaging in their true national sport – imposing higher taxes. Naturally, their “solution” is to impose higher taxes in Monaco, not to lower taxes in France. At least the Spanish government, when confronted by competition from soccer clubs in other nations, created a special low-tax regime for soccer players. That’s not the right answer. There should be low tax rates for all. But a special loophole for soccer players is a “far-less-worse” approach than what France is doing. It’s also worth noting that the French approach won’t work. I’m not saying they can’t impose higher taxes on the Monaco soccer team. But I am saying that the French soccer league will continue to lose top players so long as the government has a punitive 75 percent tax system. Entrepreneurs are escaping France. Actors are escaping France. And now top soccer players have a big tax incentive to play other places other than France (or Monaco). P.S. Speaking of soccer, you probably won’t be surprised to learn that ordinary people were screwed over at the last World Cup in order to benefit the rich elitists in private jets who like to lecture the rest of us about our carbon footprints. P.P.S. It has nothing to do with public policy, but I was amused that the United States advanced farther than France at the last World Cup. P.P.P.S. Returning to the realm of public policy, the statists in Europe have decided that free soccer broadcasts are a human right. P.P.P.P.S. The United Kingdom also has lost high quality players because of excessive taxation. P.P.P.P.P.S. Since I’m writing about sports, I suppose this is a good opportunity to pat myself on the back by sharing this award from last weekend’s tournament. I came to the plate 22 times and came away with two home runs, eight doubles, six singles, and a walk, while scoring 15 runs and driving in 16 RBIs. 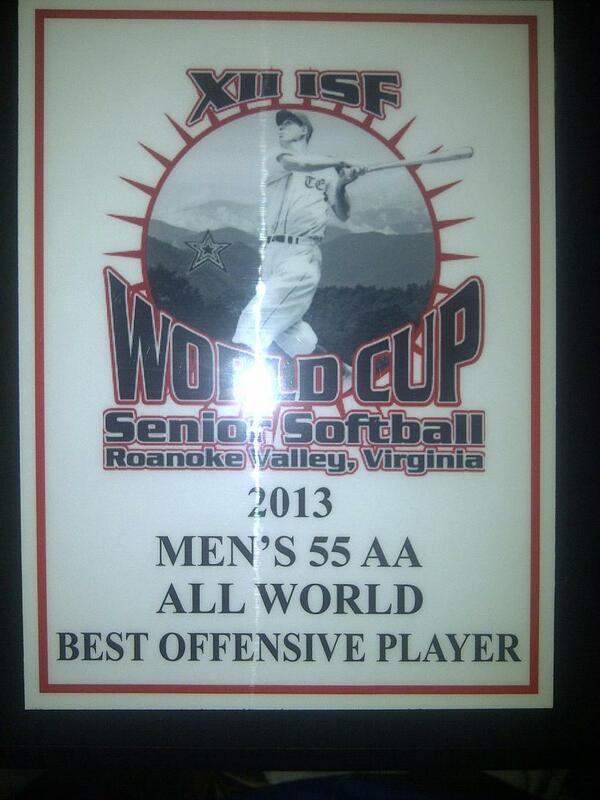 I’ve had plenty of bad softball performances over the years, but fortunately they never give awards for screwing up. Now if I can merely convince politicians to reduce the burden of government spending, I’ll be able to say 2013 was a good year. This is the European vision in a nutshell. Normal people can’t sneak over to these states to hide their income- but any decent sized business can. And it looks like Socialist politicians favor them too. I wonder how many Mittlestand German business owners have taken “ski trips” to Switzerland- only to spend a day or two at the bank? on June 26, 2013 at 9:31 am Instapundit » Blog Archive » DAN MITCHELL: The French National Sport Is Taxation, not Soccer….